Marlin Woods is the Founder and CEO of Benefits Plus Consulting, a vendor management consulting firm that specializes in pairing best-fit health and welfare benefits vendors to employers through a revolutionary matching system. “First and foremost, I returned to the Pittsburgh Business Show because I appreciate small business. I appreciate small business because I am a small business owner. Small business drives the culture, and the identity of Pittsburgh and the show itself highlights and even showcases this wonderful culture in Pittsburgh, a combination or a collective body of businesses, mostly small, some large and others in between. And to see this collective body of networking opportunities, transaction opportunities, and other types of relationships and synergy, it is a wonderful environment to be in for two days,” Woods said. Woods, a member of the advisory board of the National Workplace Benefits Association, is a national public speaker on sales behavior and inspirational messaging and has over 20 years of sale leadership experience. Woods also works in community mentorship and is the founder of the “Empower Me” Motivational Mentorship Seminar, a bi-annual seminar that provides mentorship exposure to African Americans across the United States in order to increase quality opportunities in leadership and entrepreneurship. 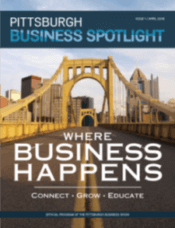 The Pittsburgh Business Show provides business owners, like Woods, with the opportunity to become acquainted with the business community of Pittsburgh, which Woods said has provided him with leads that have led to lasting relationships. “The primary reason that I am involved is because Linda Jo produces a quality product. If my name is going to be associated with it, then it must be quality,” Woods said. Woods will be the Master of Ceremonies for Pittsburgh Business Show May 14 and 15, 2019 at the David. L. Lawrence Convention Center. Currently, we have over 30 speakers and 4 workshops that you can attend throughout the two-day show. Visit www.PittsburghBusinessShow.comto purchase your tickets.